This easy pho ga will cut hours off your prep time. If you know anything about traditional pho ga (aka Vietnamese chicken noodle soup) recipes, the broth is supposed to be simmered all day with a variety of steps and ingredients. Some days, I would suggest this, but in general, life is a bit too busy for an all day affair with soup. Unfortunately, that does not quell the cravings for this takeout favorite. This recipe can be made in as little as an hour (some simmering is required...), but will surely bring home your favorite pho flavors. 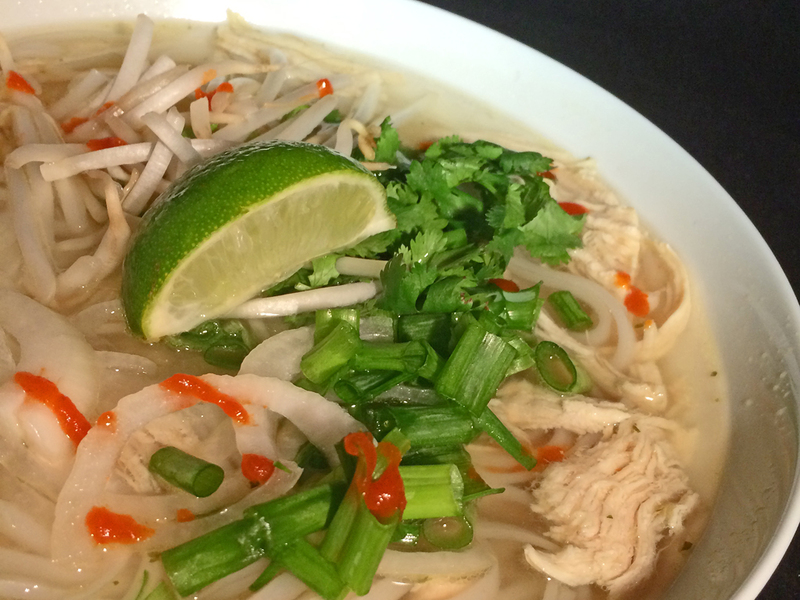 Try this easy pho ga today and you may "accidentally" lose that takeout number. 1In a large saucepan, combine all ingredients. 5While simmering, place pad Thai noodles in a bowl with hot water. Let sit until soft. 7Serve soup over noodles with whatever toppings you choose.